Astronaut Steve Austin (Lee Majors) suffers crippling near-fatal injuries after crashing his experimental spacecraft. His body is rebuilt with bionic technology which gives him superhuman abilities which he uses on missions for a covert government agency, battling foes ranging from crime syndicates to an indestructible Russian space probe and Bigfoot (actually an android constructed by aliens – no, I’m not kidding). Steve Austin. Astronaut. A man barely alive. Gentlemen, we can rebuild him. We have the technology. We have the capability to make the world’s first bionic man. Steve Austin will be that man. Better than he was before. Better. Stronger. Faster. Finally, this segues into a sequence demonstrating the results of that surgery. Austin is seen lifting impossibly heavy gym weights with his bionic arm and running at 60mph. The latter was filmed using a slow-motion technique which became the show’s characteristic method for portraying action scenes in which Austin used his bionic abilities to run or fight. Only in this last segment does the show’s stirring, high-tempo theme music kick in. At the end of the intro, we see Austin running at top speed wearing a red jump-suit which will be familiar to many boys-now-men of a certain age – including the younger version of myself – as the attire worn by the Steve Austin action figure. Believe me, at the age of seven this was the coolest thing ever from the coolest show on TV. Although admittedly now, watching back old clips, the outlandish plots, slow-motion action sequences and accompanying electronic sound effects – many of which would later be recycled by executive producer Glen A Larson in Battlestar Galactica and Knight Rider – are more than a bit naff by modern standards. Even so, The Six Million Dollar Man was immensely popular during its run, and has become an iconic part of Seventies culture. I defy any forty-something male not to prick up their ears in recognition at the theme tune, or to deny that at some stage they didn’t attempt to imitate Austin’s slow-motion high-speed running in the school playground. It wasn’t just me, right? The programme is based on the 1971 book Cyborg, written by former US Air Force pilot and NASA PR man Martin Caidin. The lifting body spacecraft seen crashing in the show’s intro is real footage of the Northrop M2-F2, which crashed during a test flight in 1967. However, the sequence also incorporates images of a different model, the Northrop HL-10. The latter has a distinctive central fin which is absent on the M2-F2. Austin works for the OSI, the Office of Scientific Intelligence. However, it was also referred to as the Office of Scientific Investigation or the Office of Strategic Intelligence. 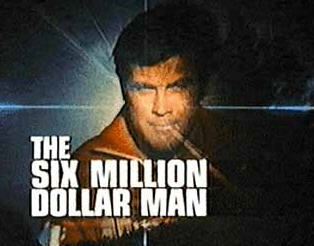 When the show was broadcast in Israel, it was called The Man Who Is Worth Millions, as the number six million is associated with the Holocaust. Before production started in 1977 on the show’s last season, Lee Majors refused to work until his contract demands were met. The producers reportedly considered a number of other actors to take over the lead role, including Gil Gerard (who later went on to play the lead in Buck Rogers in the 25th Century) and Harrison Ford, who was thought to be unsuitable as an action hero. Oops. The programme gave birth to the spin-off The Bionic Woman, which featured Lindsay Wagner as the titular Jaime Sommers. Posted in Classic TV intros, Entertainment, TV & film and tagged classic TV, cult TV, intros, Lee Majors, Oscar Goldman, Richard Anderson, Steve Austin, The Six Million Dollar Man, themes, TV. Bookmark the permalink. Fun, as usual. When it was on, it seemed to “advanced” but looks so obvious now. I explained to some of the neighborhood kids who and what The Six Million Dollar Man was and several days later I noticed several of them outside trying to run in slow motion. One of the great shows of the seventies. My father got me into it and I loved it. The Bionic Woman was great too. It does look horribly dated now – check out some of the old clips on YouTube – but at the time it was wonderful stuff. Still is, really.